Exciting news! We are about to set off on a new path here at Climb in Spain! 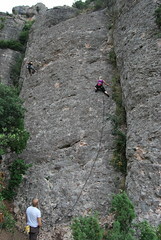 Together with the owners of Cal Sant Miquel we are preparing week long climbing trips to the heart of Catalunya. The trips will include transfer, lodging and a guide that takes you to some of the best climbing areas of the world. Rest day activities will include vineyard visits, Barcelona-tours and if the weather is good and the sun strong we will of course spend an afternoon or two at the beach. The house is perfectly located right by Montserrat and its 5000 pitches of climbing. We can also easily do daytrips to the Lleida-area with all its climbing or the world famous areas in Prades (Margalef, Siurana, Montsant etcetera). Each group will only consist of a maximum of 8 people. So what is our twist to this concept? Our idea is to focus on the passionate beginner who want their first climbing trip to be fun and trouble free with lots of good climbing and experiences beyond the cliff. We want to bring you to the best areas to lead or toprope 4a to 6b and keep you well clear from polished, bad routes that often are the only choice for a beginner at some major climbing areas as Rodellar and Siurana. We will offer two types of climbing weeks as a start. One for you who can climb and lead indoors and maybe have climbed a little outdoors. You want to start leading some sport climbs and toprope a little too. You want to go to Spain and experience a little of all this that you’ve seen on climbing DVDs and the internet but you don’t know where to start. The second type of climbing week includes a climbing course for a start and then you have several days to practice your new earned skills. Leading, setting up top ropes, multipitch and more. We are also hoping this concept might attract instructors from around the world who is looking for a good base camp here in Catalunya. Do you run climbing courses or technique courses and want to take your clients to Spain? This is for you! Dates and prices to be announced soon. If you have any questions, please send me an e-mail. Tagged with beginner, courses, trips.